Attica Correctional Facility is a maximum security/supermax prison in the town of Attica, New York. After it was constructed in the 1930s, it held many of the most dangerous criminals of the time. Now it is 1971, and Attica is the site of a hostile prison riot. The riot will result in 43 deaths, of which 33 are convicts and ten are correctional officers and civilian employees. One officer will die at the hands of the rioting convicts. The rest will die by gunfire from state troopers and other retired officers. 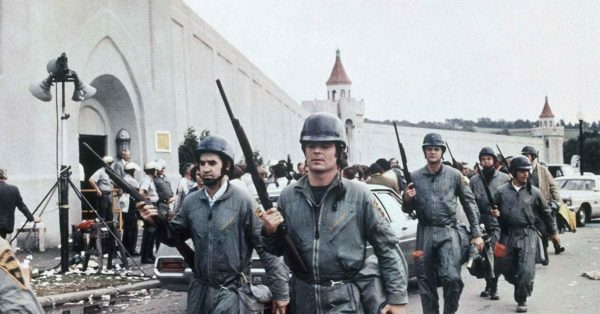 You and your fellow guards must work your way through Attica, figuring out how to safely escape the prison during the riot. Can you make it out of ATTICA without getting killed by the convicts or friendly fire from the police? This is a 3-Room game! Cutting edge electronics, brain-teasing puzzles, and out-of-the-box clues! All Ages Welcome. This place is awesome. We had SO much fun. It is a great experience overall, whether you’re a first timer or an experienced escape artist! Highly recommended 🙂 We will be back most definitely. Absolutely stunning facility. The game master was exceptionally knowledgeable and the clues were perfect. The lobby is beautiful and our game was challenging, yet tons of fun. We had a great girls night out there! Can’t wait to come back and do all your rooms. Best escape room in Grand Rapids! My wife, two daughters, and 3 grandkids, ages 8, 11, and 14, did Devil’s Island. We had originally signed up for Contamination, as we figured it would be perfect for the 7 of us. The manager suggested Devil’s Island might be more appropriate for our 8 year old, and we were able to switch. She said about 25% solve the problems in the allotted time. We did it with 7 minutes and 29 seconds left. The support is helpful, without making it too easy. There is a good variety of challenges to solve. Everyone enjoyed it, from the 8 year old to 74 year old grandpa.